Ghana’s Andre Ayew celebrates after his team’s first goal during its World Cup match Monday against the U.S. Ghana faces Germany on Saturday. After thrashing Portugal 4-0 in its first game, Germany has seen its probability of winning the World Cup steadily rise, to 13.4 percent from 10.7 percent. That increase is more than any team’s since the tournament began, except the Netherlands’. The Germans face Ghana in the second game of the day. 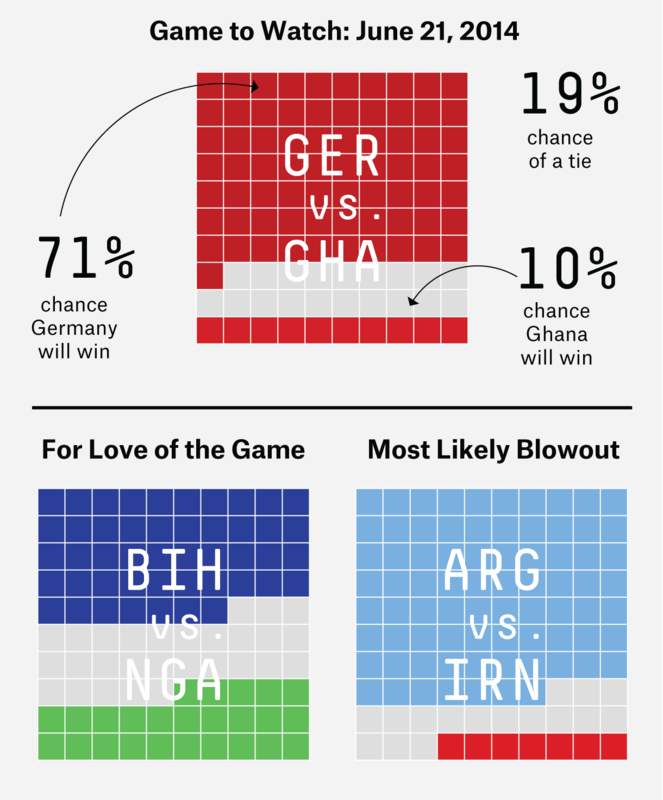 The odds are stacked in favor of Germany (71 percent to Ghana’s 10 percent) in our Game to Watch, so Ghana will need an unlikely win or draw against if it has any hope of seeing the knockout stage of the tournament. Germany is sitting pretty atop Group G with a 97.9 percent chance of advancing. Despite the apparent mismatch, Germany and Ghana still had the highest harmonic mean between the Soccer Power Index (SPI) scores of any two teams playing each other Saturday (82.0, compared with Argentina vs. Iran at 78.4 and Bosnia-Herzegovina vs. Nigeria at 76.9). Both Germany and Ghana are powerful defensively, but it’s Germany’s offense — the strongest in the tournament, according to ESPN’s SPI — that poses the biggest threat to Ghana. Ghana outplayed the U.S. on Monday, controlling 60 percent of the possession and outshooting (both on goal and otherwise) the Americans in a game that probably should have ended in its favor. But of its 21 shots, only one managed to find the back of the net. So, if Ghana hopes to dig itself out of the hole it’s in in Group G, it must score against Germany. Its best hopes lie in the Ayew brothers — Andre scored in the 82nd minute against the U.S., and his younger brother, Jordan, has scored 16 goals for Sochaux in the top French league this season. Ghana has a 89 percent chance of being eliminated from the Cup, but a win or draw against Germany and an unfavorable outcome for the Americans against Portugal on Sunday could drastically change the dynamics of Group G.
In Costa Rica’s 1-0 victory over Italy, the losers had the advantage in possession, with 731 touches to Costa Rica’s 508. But Costa Rica had 91 touches in the attacking third compared with Italy’s 83, and it created nine chances to Italy’s six. The Italians’ 83 touches in the attacking third were their fewest in a match in the past five World Cups. Italy’s offensive futility was reflected in other stats as well. Of its 10 shots, only two were in the attacking penalty area, which ties for its fewest in a World Cup match since the 1966 tournament (as far back as ESPN Stats & Info’s data set goes). The team was called offside 11 times, tied for the most in a World Cup match since 2002. Costa Rica also shut down two of Italy’s biggest stars. Andrea Pirlo completed one of four passes in the attacking third; he was 12 for 12 on such passes in Italy’s first match, against England. Mario Balotelli had 24 touches, the fewest of any Italian starter, including seven in the second half. That tied for the fewest of anyone on the pitch. The victory advanced Costa Rica to the knockout stage for the first time since 1990 (it was eliminated in the group stage in 2002 and 2006 and didn’t qualify in the other years) and eliminated England in the process. It is the first time since 1958 that England has failed to reach the knockout round. In the match between Switzerland and France, Switzerland had more overall touches, 636 to 532, but France more than doubled the Swiss in the attacking penalty area, 23 to 10. Led by Karim Benzema, whose match-high seven touches in the penalty area gave him a tournament-high 16, France is averaging 25.5 penalty-area touches per match (the best in the tournament).